The Carriage House Apartments are located next to Community Corners in Ithaca, NY. With on-site management and many newly renovated units, The Carriage House Apartments offer modern living with convenience - we are only a ten-minute walk to Cornell University's North Campus, and directly on the bus route that takes you to Cornell in just three minutes. We are also within walking distance to several shopping plazas in Ithaca for all your shopping and dining needs. *Rent includes Heat, Hot & Cold Water, Garbage & Recycling, Cable, and Internet! 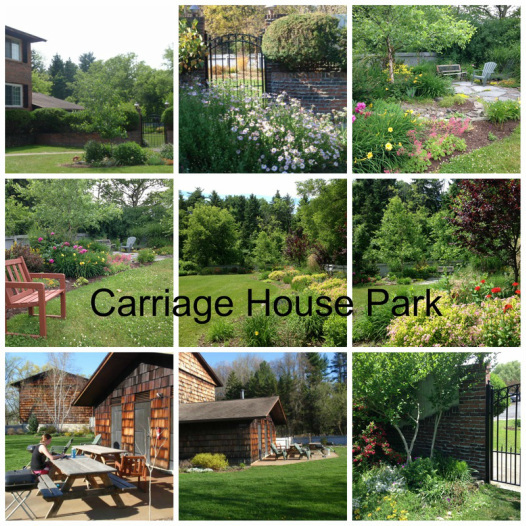 The Carriage House Apartments in Ithaca, NY has its own uniquely landscaped private park for residents and guests of The Carriage House. Have a barbecue, read a book, sunbathe, kick a soccer ball, look at the beautiful gardens, or build a snowman in the winter! Click here for more pictures. Walk to Cornell's North Campus in ten minutes! Private outdoor, garden-like community area with grill, picnic tables and seating area for relaxing, cooking, games, etc. Located adjacent to Ithaca's Community Corners with fitness center, restaurants, cafes, shopping, convenience store, barber shop, banks, and much more!